Sorry, you can only order up to 26 units of this product! The FM5 5-ton electric log splitter is a fast, lightweight and compact log splitter that can split logs up to 300mm in length. 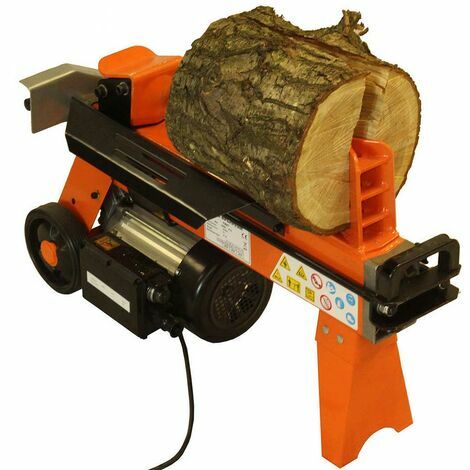 This is an ideal machine to split soft or green wood. The FM5 is one of the fastest small log splitters with a cycle time of only 9 seconds. This machine has a 5-ton splitting force with a 2200W motor meaning that it can easily split logs for small to medium wood burners. With its compact size the weight of the machine is only 32Kg, meaning that it can be easily transported. In order to comply with the latest safety regulations, the FM5 is operated by simultaneously using a push button and lever. Can also be fitted with our Duo-Cut Blade (sold separately) to increase efficiency. This will reduce the max log length to 230mm.